In a competitive market, pricing is the management’s business. The consumer has so many choices -- single screens, multiplexes, TV, online streaming or DVDs. Nothing forces him to go to a multiplex. Nor are films an essential commodity where prices have to be regulated, says Vanita Kohli Khandekar. Circa 1992 -- a rat scurried past my foot. I whipped my legs up on the torn chair and continued watching Jo Jeeta Wahi Sikandar. This was about 25 years back at Navrang theatre in (then) Bombay. None of my friends responded to the rodent. Nor did we eat the food (stale) or use the toilets (filthy). When the first few multiplexes came to Mumbai in 2000, we rejoiced at the clean loos and good seats. Over the years as they added more screens, premium lounges, gourmet food, digital projection and so on, multiplexes have transformed the business. Since 2000, the film industry grew over five times to Rs 15,600 crore largely due to multiplexes. However, their single biggest contribution has been cleaning up the business, ridding it of dirty money. Every ticket sold is accounted for; the money flows back into the system either as taxes to the government or working capital for the industry. My book The Indian Media Business captured this some years back. Circa 2018 -- as the stock market beat down the stock prices of PVR Cinemas and Inox Leisure by a fifth last month, I wondered what happened? The glee with which mainstream media is covering the possibility of outside food being allowed into multiplexes, the angst on social media on the price of popcorn and Pepsi, point to a deeper problem. 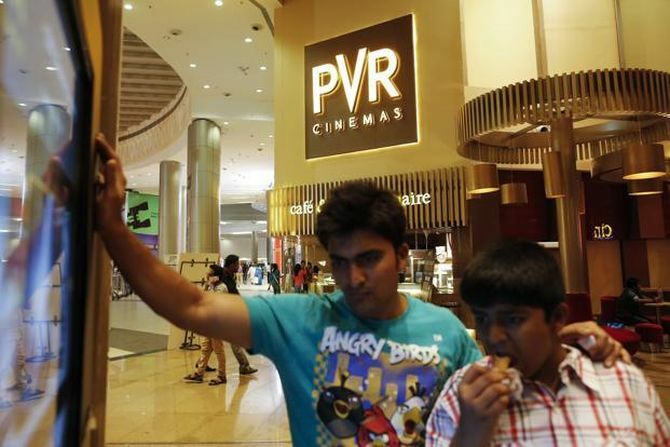 Have multiplexes lost the plot? In August 2017, a resident filed public interest litigation in the Bombay high court challenging the prohibition on carrying outside food and beverages inside movie theatres and multiplexes across the state of Maharashtra. Meanwhile, in June 2018, a group of people from Raj Thackeray’s Maharashtra Navnirman Sena attacked the assistant manager of PVR Icon, Pune, over its food prices. In July 2018, in response to a question in the Maharashtra assembly, Minister of State for Food and Civil Supplies Ravindra Chavan said that the home department is coming up with a policy to deal with the issue of taking outside food into multiplexes. Nothing was notified but stock prices tumbled. Food and beverages bring in a fourth of the revenues for most chains. They are the second most profitable revenue stream after advertising. There isn’t much to be made on a ticket. On a Rs 100 ticket, roughly a third each goes to taxes, producers/trade and the multiplex chain. Analysts reckon there is a buffer to cut F&B prices, but very little. In the year ending March 2018, PVR had a net profit of 5 per cent and Inox 8.5 per cent. The Multiplex Association of India in a representation to government says that across the world, food is an integral part of the business model of cinema theatres. If the freedom to price and sell is taken away, they would start shutting down. This could hit the quarter of a million people employed directly and half a million indirectly by multiplexes. “The relationship between a patron and a cinema theatre owner is purely contractual and private in nature, where the person who buys a ticket voluntarily agrees to the terms and conditions of admission into a cinema theatre,” says the MAI. It contends that carrying outside food is fraught with risks -- of smells, sound, unruly behaviour from people carrying alcohol inside and of security. Bombs could be smuggled inside. Multiplexes are not equipped to deal with these risks. It is like asking that a patron be allowed to carry his own food to a restaurant or bed to a hotel, says the MAI. That to my mind is the nub of the issue. In a competitive market, pricing is the management’s business. The consumer has so many choices -- single screens, multiplexes, TV, online streaming or DVDs. Nothing forces him to go to a multiplex. Nor are films an essential commodity where prices have to be regulated. Even so, why are ticket prices so high, I remember asking a multiplex operator some months back. His point -- ticket prices vary madly from Rs 70 (for morning shows on weekdays or in lower income areas) to Rs 500 or so on weekends. For blockbusters (10-12 a year) they go up by 10-20 per cent. But the prices brandished are usually from only the 50-odd premium screens (of a total of over 9,000) in upmarket catchment areas. In towns with lower rentals, say Jalgaon, prices are lower. What happens next? The Mumbai case was heard on August 8. In Madhya Pradesh, a similar PIL in July 2018 was dismissed saying that a commercial decision of a private firm cannot be made subject matter of a judicial review. In the same month, the Jammu and Kashmir high court allowed people to carry outside food in cinemas in response to a PIL. In December 2017, the Supreme Court ruled that hotels and restaurants can sell bottled water above the maximum retail price or MRP. And ambience is what cinema theatres sell, along with the popcorn. Which funds should you invest in after RBI rate hike?